Here's my completed wall hanging "Jumpers" designed/pattern by Jeffie Johnson. See my post August 20, 2014 with information about sources for the African wax fabrics and the pattern for "Jumpers". Here's a detail of the girls' faces, jump rope quilted using a utilitarian stitch (#8 on my Bernina 440) on my sewing machine. There are stars in the free motion quilting at the top but not in the lower part of the quilting. The earrings and decorations on their shoes are buttons and the jump rope handle is a bead. I really enjoyed working on this project. The designs and colors of the African wax fabrics are amazing. And of course I love this delightful appliqué pattern! The dogs are all at Day School today so the cat and I have the house to ourselves. My tasks for the day were to sandwich and pin paste 2 quilts tops. 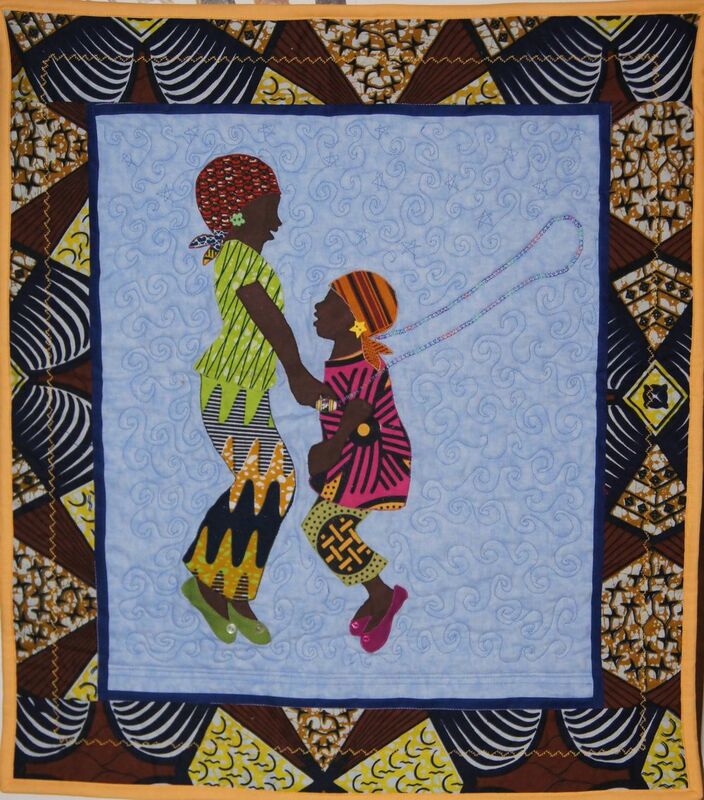 The African Village quilt was such a big hit with my dog trainers that I got a commission to make another. I usually only want to make one copy of a quilt. But I wanted to make the African Village Quilt with the diamond variation. So this time I was happy to make another. The 2 other trainers who aren't getting a quilt looked crestfallen. I want to do something about for all of them because they have all been so great! I decided to predominantly use real African batiks in my Diamond African Village. It turns out that while the fabrics are all designed in Africa, a lot of the production occurs in Holland. I went online and looked around. I finally decided to purchase my fabrics from the Tambo Collection on Etsy.com. I found a great selection of fabrics and also the appliqué pattern shown above. The pattern for the girls jumping rope is called "Jumpers", copyright 2007 by Jeffie Johnson. It is distributed by Sew Fabulous. I fell in love with the pattern when I saw it. One of the 4 dog trainers I work with has 4 daughters. I figured there has been a lot of jumping rope at his home over the years! So I decided to make it for him. I cut it out yesterday and used Heat-n-Bond lite to fuse the pieces to the background fabric. I struggle with reversing designs. I thought that since I was attaching the bonding material to the back of the fabric I was all set. Not so. My appliqué design is a mirror image of the pattern I purchased! Oops. But I decided that it doesn't matter. The picture is just as cute and I didn't want to waste any of these special fabrics re-doing it. Here's what I've done so far. It's still a WIP. The jump rope is quilting, using the #8 utilitarian stitch on my Bernina, with the width narrowed to 3. With the Sulky 12 wt variegated thread, it makes a fine jump rope! I still need to come up with something for the fourth trainer who's particularly fond of my dog Taffy.